Kataifi dough, also known as shredded dough, is a typical Greek and Turkish ingredient - in Turkey they call it kadayıf - made, just like fillo dough, with flour and water. If you want to see how it's prepared, take a look at this nice Turkish/American weblog. Kataifi is made of long, very thin strands of dough, a bit like angel hair pasta. It's very often used for sweets, in combination with honey and pistachios. Here in Holland you can find it in Turkish shops, though the one I usually go to told me they sell it only before the Ramadan ends, which I think is a pity. Anyway, I'm lucky to have a pass for all the big food wholesalers here in Amsterdam and that's where I bought a packet of frozen kataifi to experiment a bit with this nice recipe I learnt at the Gambero Rosso cooking school in Rome, gamberoni in pasta kataifi. In the Southern Italian region Puglia, which is practically opposite to Greece geographically speaking, kataifi dough is already quite popular. 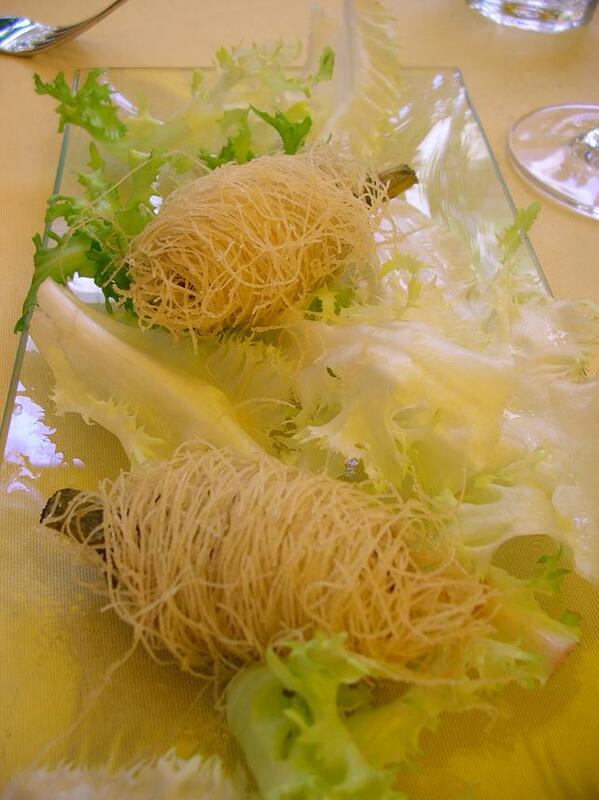 I tried my first shrimp in kataifi in the beautiful city of Trani at the Osteria Corteinfiore restaurant last May. There they fry the shrimp in peanut oil and serve the dish as an appetizer, while at the Gambero Rosso school I learnt how to prepare them in a slightly different way. A little less fat, with a nicer golden brown colour and as nice tasting as the deep-fried ones. The secret is shallow frying them in olive oil until they're nice and crunchy. Yummie. The best shrimp you can use for this dish are the raw ones. I use the smallest size of Black Tiger prawns. I clean them one by one removing heads, shells and legs and then deveining them (removing the dark intestinal tract on their back). It's a lot of work but if you've cleaned a couple of them you get faster. And raw shrimp are much nicer than the pre-cooked ones. If you fry them in a kataifi crust they'll stay very moist and soft without getting rubbery like the pre-cooked ones. I like eating them with a garlic/tarragon mayonnaise. First I pound these two ingredients to a paste with mortar and pestle, and then I add the paste to the self-made mayonnaise. On the Gambero Rosso foto (above) you see an oyster mayonnaise. Since I don't like oysters, I came up with this herby-garlicy version which goes perfectly well with the crunchy shrimp. Prepare the mayonnaise first: put egg yolks, lemon juice and a pinch of salt and pepper in a mixing bowl. Slowly add the sunflower oil beating the mixture at the lowest stand of the mixer. Once the mayonnaise starts to get thicker, add the rest of the oil and keep on beating until it reaches the right thickness. Pound the garlic and the tarragon leaves to a creamy mixture in a small mortar. Add to the mayonnaise stirring gently. Clean the shrimp: carefully remove heads, shell and legs but leave the tails. Devein the shrimp and rinse under the tap. Pat dry with kitchen paper and season with a bit of pepper. Defrost the kataifi dough and loosen the strings. 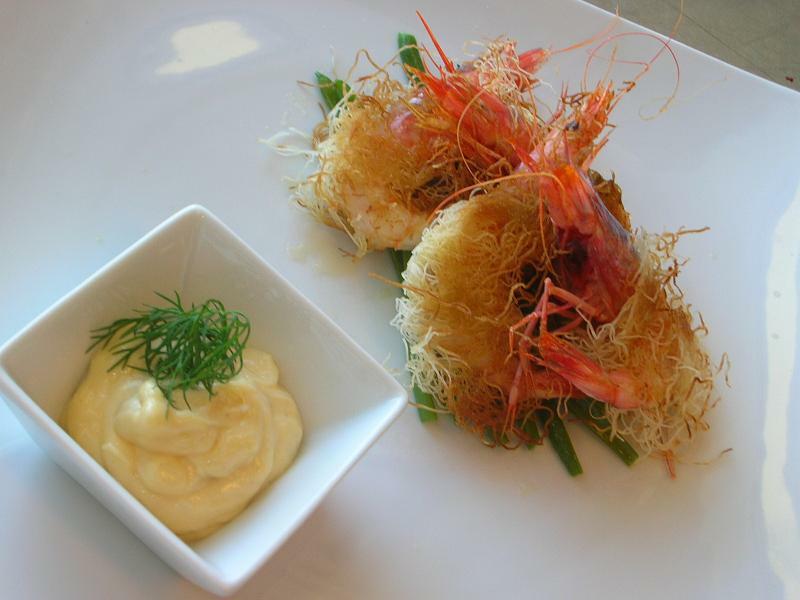 Wrap some kataifi around each shrimp. Shallow-fry the shrimp in a non-stick frying pan with a little olive oil until golden brown and crunchy and serve immediately while still hot with the garlic mayonnaise.